It seems amazing that one can arrive at the preserve at 6:30 am, and still miss some of the best morning light! How much earlier can sunrise get?? Nonetheless, I was happy to see the White Ibis featured above looking stunningly rosy, just as the dawn broke (alternatively, one might say he looked like he’d just finished dribbling a strawberry popsicle down his chin!) And it was wonderful to watch the colors of the sunrise literally changing the feathers of this Great Egret from white to a subtle pink as he started preparing for his day. 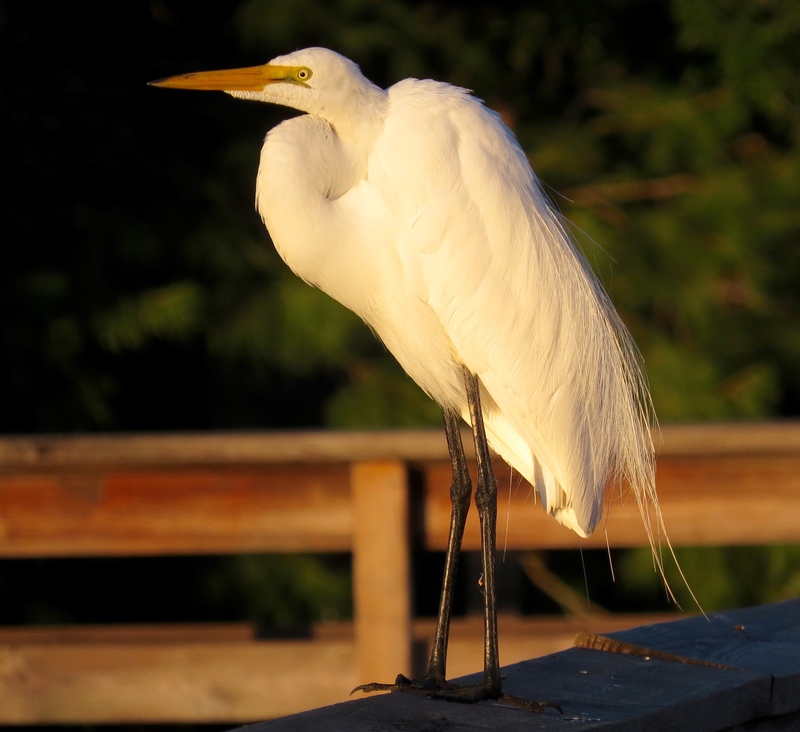 But what really fascinated me was that this other Great (White) Egret – who landed on the boardwalk just 20 feet away, was bathed in the yellow glow of the very same sunrise, instead of pink – just exactly 9 minutes later! 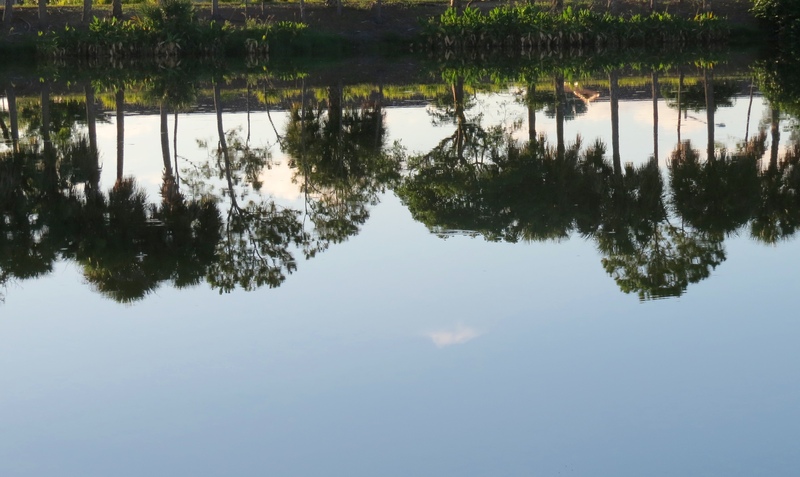 As I walked along, I was delighted, as usual on quiet mornings, by the utter stillness of the water. 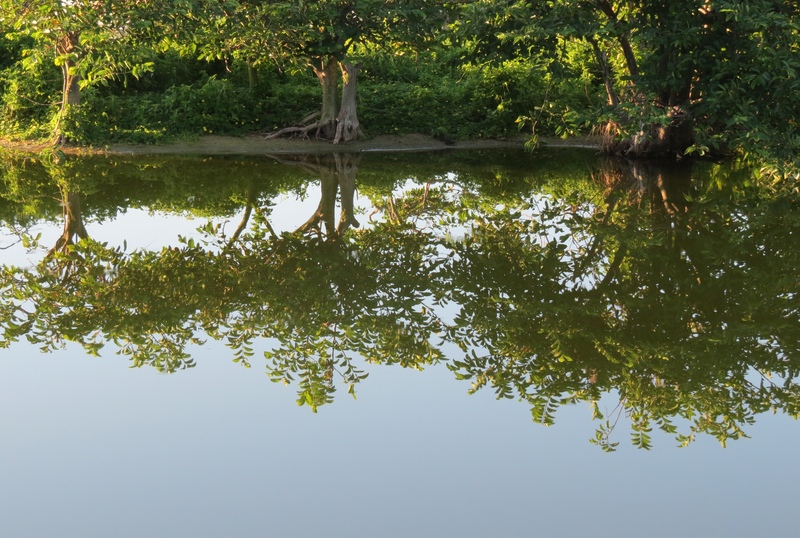 The reflections of the trees and the islands are so vivid at times like this. 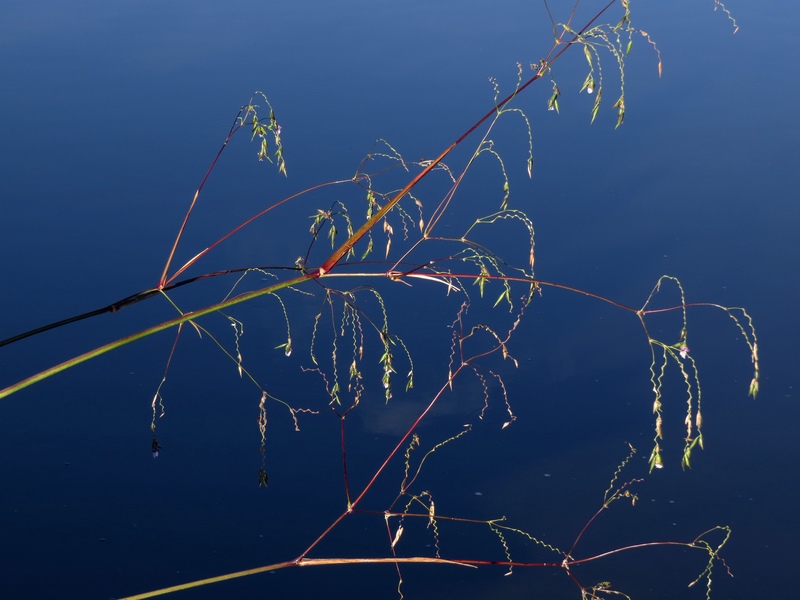 The pond plant life of all kinds looks even more beautiful against (or reflected in) that calm, placid water at this time of year in the early hours. Great Egret heading out to pick up some breakfast. 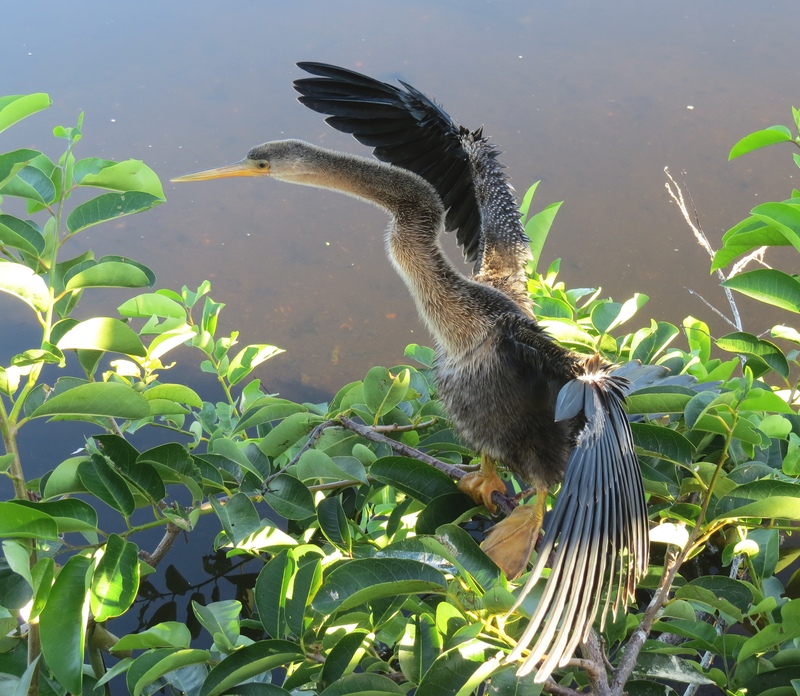 Female Anhinga doing her morning stretching exercises. Everything was peaceful and the birds were still just waking up and stretching, or heading out for breakfast, by the time I left to walk home. Luckily I caught the shade most of the way, as the temperature was getting close to 90° – though it wasn’t yet 9:00 am. 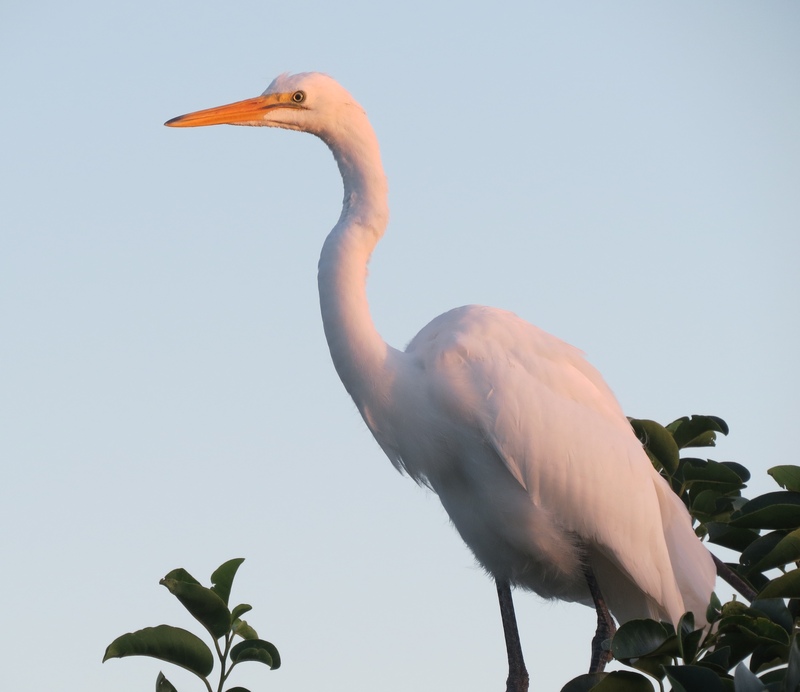 This entry was posted in Birds, Marsh/Wetlands and tagged Anhinga, Great Egret, White Ibis. Bookmark the permalink. 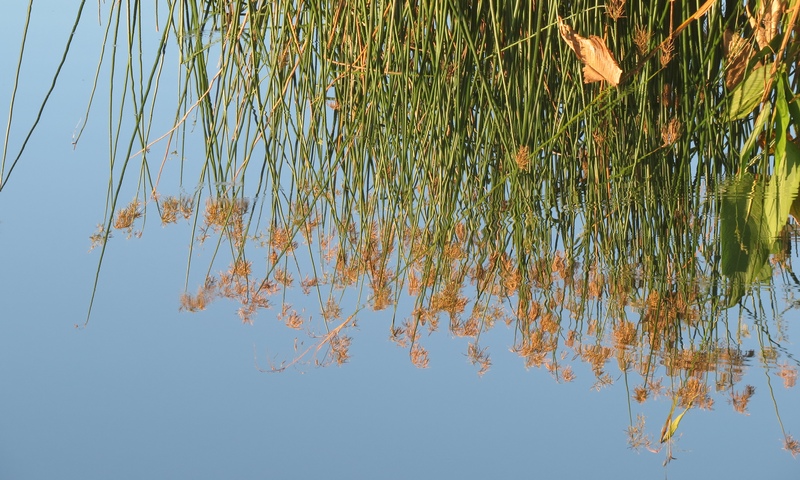 Early morning pictures are always so unique and beautiful, your efforts have certainly displayed this in your post. Thank you, AB! Now I just have to make the effort to leave the house by 6 or 6:15 am more often. It’s so worth it! That’s so true BJ – the early bird not only catches the worm but the bird also! :-) You can not beat the ‘morning chorus’ any birder will tell you, and I’ m sure you know, it’s the best part of a birder’s day! So nice of you to visit, HJ – enjoy your day! Beautiful images, Carol. Whenever I go out early it seems the birds are not out and about. You have some real heat going now. Pays to get out early. Thank you, Donna. Sometimes it’s too early for there to be much action here, too, but at this time of year, in this climate, it’s good to get out early. Its pretty darn hot out there in the sun by mid-morning. Thanks Steve!! I love Steve G’s work! 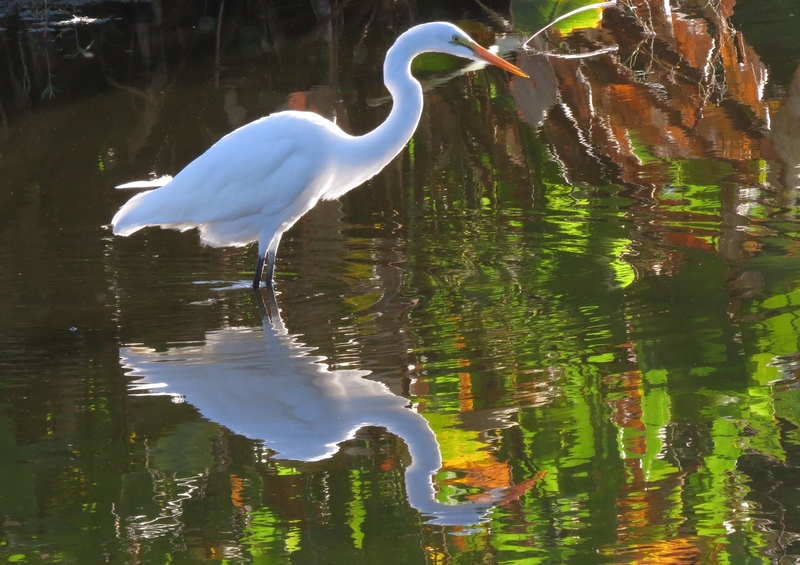 Beautiful, tranquil… Love the Egret photos. Thank you for sharing, Bj! 🙂 Happy Sunday! It certainly was a tranquil morning, Amy. Glad you enjoyed it! The colors and reflections are so pretty. Much appreciated, Pat. Hope you’re having a day filled with wonder! !